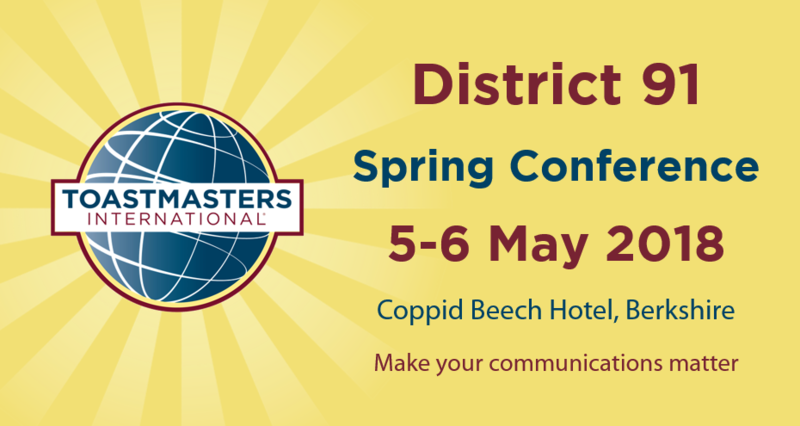 At Toastmasters District 91 we are excited to report on the amazing work being accomplished by our many member clubs. With a special business breakfast event, we will strive to provide useful information that drives growth, business development, and share developments that are changing our world. One such world-changing development is the continued evolution and implementation of artificial intelligence and new technologies. There is now a dedicated website, with additional information about the conference, posted by the conference team, check out the new website. The conference programme has been published. The full list of workshops over the two days, along with contest and other information, is now available here. There may be some final tweaks on the timing of events over the weekend, we’ll update the conference programme here when we do. There are a handful (at the time of writing this newsletter) of full weekend including gala dinner tickets left at the early bird rate of £150. Once they have gone the rate raises to £170. Be quick to book here. Gala Dinner – if you are unable to attend during the day but planning to join us for dinner on the Saturday evening, there are limited gala dinner tickets left, book now here. Social Media – follow us, like and share our posts! 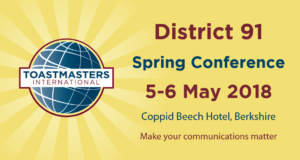 All updates and useful information about the conference, is regularly posted on the Toastmasters D91 Spring Conference Facebook page and Twitter on @D91SpringConf18.